The two diseases are cited in 54.7 percent of U.S. deaths in1997, the last year for which totals are available from the Center For Disease Control (CDC), according to a newly-released report. The Center confirms how greatly things changed in the century between the end of the 19th century and today. As the 20th century began, the nation was mostly rural. In the 20th Century, infectious diseases were the most feared of killers. The Center reports, "Infectious diseases ran rampart in the United States and worldwide and topped the leading causes of death." Today, the report concludes, infectious diseases are less a threat now. "Chronic diseases top the threat list." 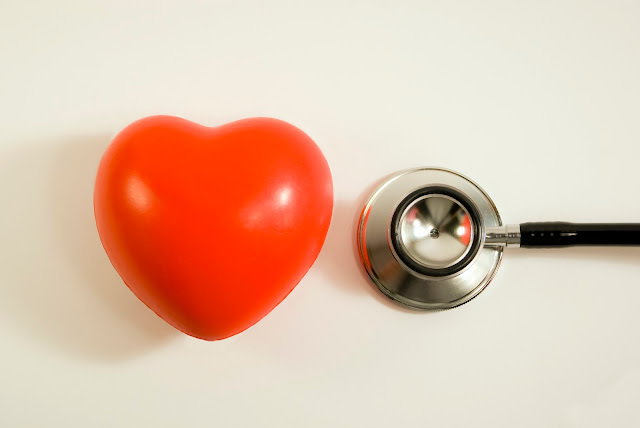 Heart disease accounts for 31.4 percent of all deaths, followed by cancer, accounting for 23.3 percent of deaths each year. Strokes, at 6.9 percent, finished a distant third. While health care in America is better than ever, and - because of affordable health insurance plans - medical treatment more widely available to American families than ever before, the United States nevertheless is falling behind levels of care and treatment of other industrialized nations. The United States ranked only 19th in life expectancy for women when the figures were complied for 1997. U.S. males ranked 25th. There was a four year longevity gap between Japanese women, the highest ranked, and U.S. women. In the same time frame, life expectancy for men in 1997's report was 72.4 years. Today’s rating is 76.4 years. The center warns that statistics, while fascinating, provide only a part of the picture. In the United States today, the report notes, quality of health care is widely divergent, depending greatly on income levels, area of residence, cultural assimilation or lack of it, and age. Unintentional death, primarily from automobile crashes, is the fifth leading cause of death for the total population, but they are the primary cause of death for people aged 1 to 44 years of age. Similarly, HIV/AIDS is the 14th leading cause of death for the general population, but it is the leading cause of death for African-American men between the ages of 25-44 years. Overall, the CDC report notes, the leading causes of death in the U.S. "...generally result from a mix of behaviors; injury, violence, and other factors in the environment; and the unavailability or inaccessibility of quality health services." The federal agency suggests a program aimed at better understanding and monitoring population behavior patterns, controlling environmental factors and upgrading community health systems might ultimately "... prove more useful to monitoring the nation’s true health, and in driving health improvement activities, than compilation of death rates that reflect the cumulative impact of those factors." As things stand currently, birth defects are by far the leading cause of death for children under one year of age. For 1-4 years, unintentional injury is by far the biggest killer, as it is the case for children 5-14 years of age. For young people aged 15 to 24, accidental death accounts leads the list, but homicide and suicide reflect substantial percentages. For persons aged 25-44 years of age, accidental death leads, but cancer and heart disease are prominent. For ages 45-64, cancer is the big killer, closely followed by heart disease with a smaller percent of unintentional injuries. Over 65 years of age, heart disease is the primary reason for death; cancer, and strokes are well back. Genetic testing previously available only through doctors' offices is now available directly to consumers. These tests are identified as Direct-To-Consumer Genetic Tests (DTC) or At-Home Genetic Tests. There are approximately 2,000 DTC or At-Home Genetic Tests currently available and consumers now have the option to conduct their own tests for a variety of genetic issues, ranging from ancestry to paternity to early detection of genetic disease and the potential future vulnerability to genetic disease. Prices vary depending on the complexity of the test, ranging from $100 to over a thousand dollars. Consumers can access these tests primarily through print ads and the Internet. DTC marketing claims stress the privacy issue, stating that consumers have greater control over their test results when a doctor's office is not involved. The consumer takes the sample, usually by passing a cotton swab along the inside of the cheek, and sends it back to the lab. The results are sent back to the consumer directly from the lab. The consumer is usually responsible for interpreting the results; an interpretation by the lab is typically not included in the service. The clinical validity of any particular genetic test, that is whether the test is actually valid to assess what it is meant to assess, is currently reviewed by the Food and Drug Administration (FDA) when a commercially distributed test kit is involved. Test kits are reviewed prior to being marketed to determine safety and effectiveness. The designation as a "test kit" is critical under this regulation. Many DTC tests are not marketed as "test kits." According to the Federal Trade Commission (FTC), no At-Home/DTC Genetic Tests have been reviewed by the FDA. All clinical laboratories must be certified by the Department of Health and Human Services (DHHS) in areas such as personnel qualifications and quality control procedures. However, the regulations currently do not have any requirements for molecular or biochemical testing which are the type of tests that provide genetic information. This means that testing laboratories are not currently required to certify their genetic testing performance. According to the most recent information, the Secretary of DHHS recently requested a report from the Department's genetic testing advisory committee on the existing regulatory framework for genetic testing. The advisory committee report was submitted in 2008. No direct action has been taken as a result of the report and no additional regulations have been announced. Until further federal action is taken, regulation of DTC testing will remain on a state-by-state basis under the control of state health departments. Some professional associations and patient advocacy groups also play a role in laboratory oversight. Consumers interested in regulation of genetic testing in their home state should contact the state health department for information. The FDA and the Centers for Disease Control and Prevention (CDC) have both issued statements concerning DTC genetic testing and the related claims made by testing companies. The FDA and CDC caution that some of the marketed predictive tests do not have any scientific validity; that is, there is no scientific evidence that having a certain genetic profile means that specific disease will or will not develop in any particular individual. The statements also caution consumers about claims that genetic testing can be used to recommend customized dietary supplements and medication or to determine an individual's susceptibility to toxic environmental exposures. The greatest concern regarding DTC genetic testing is that genetic information is only one piece of information. Consumers acting on genetic information alone may not have all the information necessary to make a fully-informed decision. Other factors, such as lifestyle, environment, medical history, and family background should be taken into consideration. According to the FDA and the CDC, genetic testing is most effective when combined with a physical exam and medical history conducted by a medical professional. At-Home/DTC Genetic Tests are now widely available for a variety of genetic concerns. These tests are easy, quick, and convenient for consumers and do not require a trip to the doctor's office. However, the FTC in cooperation with the FDA and the CDC recommend that anyone considering At-Home/DTC Genetic Tests consult with their doctor to make sure that they understand the limitations of the test and receive the most complete interpretation of the final results. It is important for medical consumers to understand the drug approval process and how to gain access to clinical trials that may cure their illnesses. Drug approval is a complex process but a simple overview and two United States government website can help consumers to understand how drugs are approved. In several developed countries, a uniform procedure exists for determining if new drugs are safe and effective for use in humans. The International Conference on Harmonization created a common format for reporting the results of clinical studies that test new and investigational drugs in patients. The universal document is called the “Common Technical Document” and is accepted in various formats by the European Union, Japan and the United States. The FDA is Responsible for Drug Safety in the United States. In the United States of America, the U.S. Food and Drug Administration, abbreviated FDA, is charged (Code of Federal Regulations 21 CFR 314.50) with maintaining the safety of food, drugs and other substances used by humans. The FDA is part of the Federal Department of Health and Human Services. 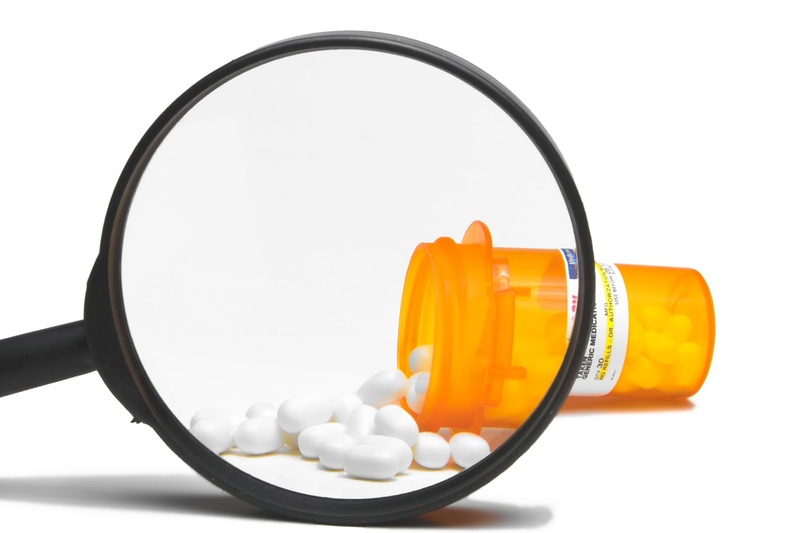 An important part of the FDA’s responsibility is determining the effectiveness and safety of drugs that are prescribed by doctors and dispensed by pharmacists. To determine drug safety, FDA scientists review data generated in clinical studies that is submitted to the FDA in the form of the common technical document. Originally, the common technical document submitted to the FDA was a paper document. Recently, an electronic version of this document has been introduced. Pharmaceutical companies develop drugs that may treat human disease. The companies perform laboratory studies conducted by research scientists to determine how a possible drug works and if the possible drug is toxic to animals. The laboratory results must show clearly that a drug is effective and safe in animals before any testing in humans can begin. Before pharmaceutical companies test new drugs in humans, they must submit applications to FDA. The applications, which are called clinical study protocols, clearly define the drug to be used, how it will be used and what types of patients will receive the drug. The study carried out according to the new drug application is called a clinical study. A group of clinical studies is called a clinical trial. All of the clinical studies in a clinical trial must be conducted exactly as described in the study protocol. A clinical trial is a large experiment that tests the safety and effectiveness of a drug in humans. 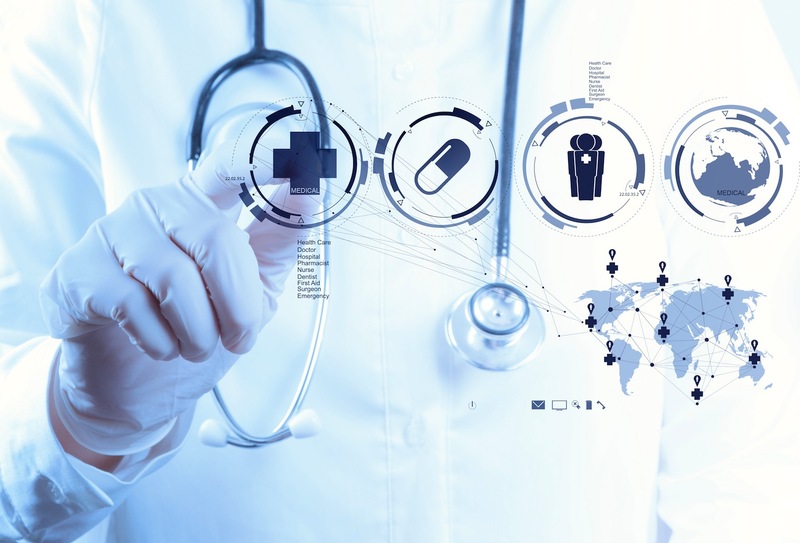 Clinical studies are conducted under the supervision of doctors and nurses. While some clinical trials involve hospital patients, most clinical trials test drugs in patients who visit out-patient clinics. 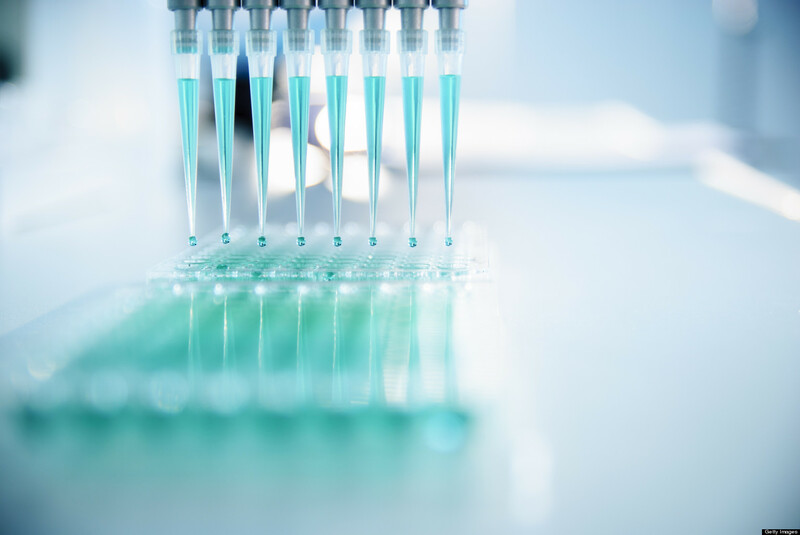 There are several stages in a clinical trial, including patient registration, patient treatment and follow-up and reporting the results to the FDA. All stages must be completed exactly as defined by the FDA. In the United States, the National Institutes of Health maintain a registry or list of clinical studies, named ClinicalTrials.gov. Medical consumers can search the list for clinical trials pertaining to their particular illness. Consumers enter the name of their disease and their location. The website generates a list of completed, ongoing and planned clinical trials that fit their needs. Adults generally do not spend a lot of time worrying about dying. Most people do not spend time thinking about what might happen to them if they were to get into a sudden accident and be placed on life support. Many times it takes a sudden death that is featured in the news to get adults to consider a key question, "Will your family know your final wishes in a time of crisis?" Sudden death of someone before their time is a stark reminder of just how short life is and how quickly life can change and be over--in an instant. The sudden deaths of Michael Jackson, Steve Irwin, John F. Kennedy Jr., Princess Diana, Heath Ledger, John Ritter, John Lennon and Natasha Richardson to name just a few are heartbreaking reminders of how quickly life can suddenly end. Actress Natasha Richardson's sudden, unexpected accident and death in March 2009 left her family needing to make difficult choices. Her family was faced with decisions of what to do about life support and once it was realized the injuries were life-ending ones, whether she would have wanted to be an organ donor. Ultimately her family requested that her organs be donated to other patients whose lives they might save. Natasha Richardson's sudden death, in particular, can serve as a reminder to make sure that your loved ones know your final wishes in the event that you are ever placed on life support. Advance Care Planning is taking the time to learn about life support and end of life care choices before there is a health crisis. Another way of phrasing it is deciding what will happen with your life on your own terms. With advanced care planning you can make choices and give directions to those left behind as to what you would want done in the event of a life-threatening medical event taking into consideration your own priorities, beliefs and values. Once you have decided on your choices, it is time to share your wishes in writing in an advance directive. 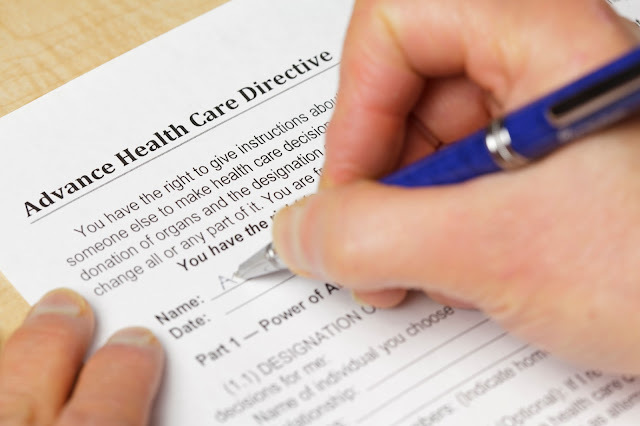 Caring Connections (part of the The National Hospice and Palliative Care Organization) defines Advance Directives as two types of legal documents that enable you to plan for and communicate your end-of-life wishes in the event that you are unable to communicate. One is a living will and the other a medical power of attorney. A living will - The will allows a person to document his or her wishes concerning medical treatments at the end of life. A medical power of attorney (or healthcare proxy) - The medical power of attorney allows a person to appoint someone he or she trusts as a healthcare agent (or surrogate decision maker), who is authorized to make medical decisions on the person's behalf. Put it in Writing Booklet is a 10-page online booklet developed by the American Hospital Association with support from the Society of Hospital Medicine. With this booklet people are encouraged to explore their choices and preferences for care in the event that they might be placed on life support and also preferences for care at the end of life. The Put it in Writing consumer outreach initiative was created in 2005 to teach the public about the importance of Advance Care Planning and of putting those wishes in writing. Putting your advance directives in writing is only the first step. You also need to make sure to take time to talk to your loved ones and tell them about your final wishes in your advanced directives. Conversations Before the Crisis is a 16-page online booklet from Caring Connections, part of the The National Hospice and Palliative Care Organization. This helpful online resource provides tips and suggestions of ways to talk about end of life care using different conversation triggers before the crisis. Learn about advanced care options. Decide on your advanced care wishes. Document your wishes. Put it in writing. Tell someone about your wishes. Making your advanced care wishes known and documented them in writing will make it easier for families to know what you would want done when faced with unexpected life-threatening health challenge, sudden accident or terminal circumstance that requires life support. Having a loved one's wishes documented in writing and knowing what that person would want done makes the task of making difficult choices in a time of crisis a bit easier for the family left behind. For individuals with acne that seems to be unresponsive to prescription medication, over-the-counter creams and alternative treatments – there is another option. Doctors are now using laser treatments to clear up light, moderate and severe cases of acne in patients. Performed typically under anesthesia as an outpatient procedure, the laser treatment is over quickly and may clear acne quite nicely. There are a few different types of laser treatments physicians use to clear up acne. However, they work in the same ways. The lasers kill the bacteria that cause acne, while also shrinking the sebaceous glands that produce too much oil. This oil is often the main cause of whiteheads and blackheads on the skin. Studies have shown that laser treatment can be more effective at clearing acne and keeping it away than any over the counter cream available. There is no evidence to suggest that laser treatments are unsafe, and the only complications one will experience are the typical side effects that occur with the laser treatments. Some individuals use the laser treatment once while others have received follow-up treatments for months without any serious or lasting side effects. With laser treatments, there are some side effects you should expect. While they’re a bit different with each person, the most common side effects include redness on the face, sore skin, shiny skin, oozing and bleeding, and other common symptoms one would find with surgery. However, these symptoms typically go away within a few days to a week, leaving the smooth, fresh skin behind. The doctor may prescribe some pain medication to get you through until the treatment site is healed. It’s quite important to choose a doctor that is a certified laser treatment surgeon. One great way to get in touch with a good laser treatment doctor is to ask your general physician for a referral. He or she should be able to give you the name of a certified, reputable doctor. If you know anyone else who has had laser surgery with great results, you may want to get a recommendation from them as well. Aside from the acne, patients who have gotten laser treatment have noticed other positive effects as well. For instance, patients with extremely oily skin and large pores have noticed that their skin is no longer oily and that their pores have become smaller, giving the skin a smoother and younger appearance. 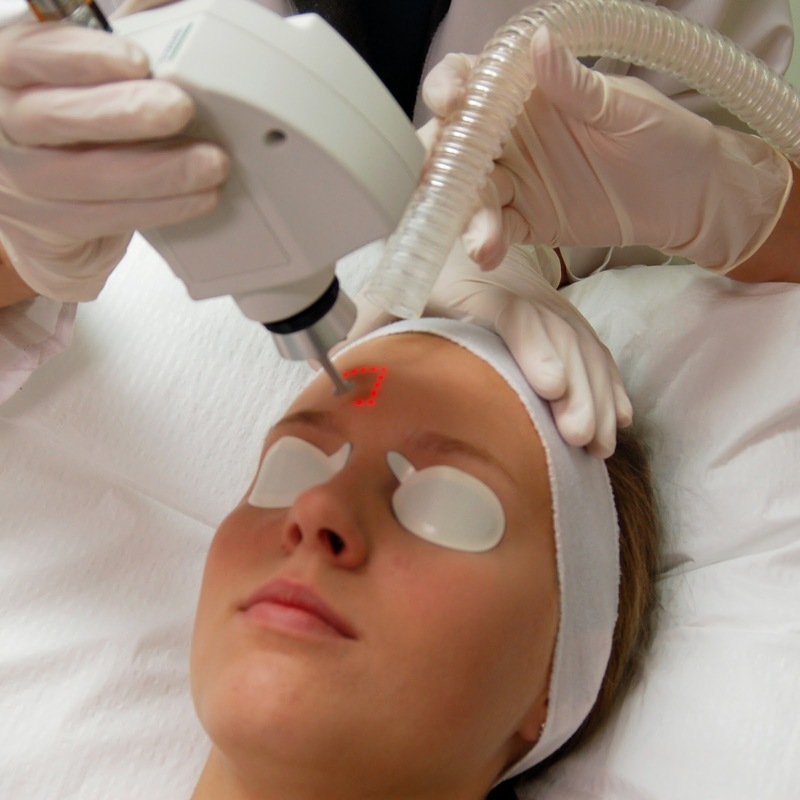 Lasers can also remove the scars from older acne, smoothing out the skin as well. Individuals receive laser treatments for fine lines and wrinkles as well. By using the information above, you can determine whether laser treatments for your acne is the best choice or not. Noise is an environmental contaminant along with radiation, and organic and inorganic chemicals such as heavy metals and pesticides. Defined as a source that emits noise high enough to impact a significant number of people, environment noise (or sound) is a non-ionized form of acousitcal radiation. Ionized radiation is emitted by radioactive substances, while non-ionized radiation comes from radio waves, microwaves, and low frequency electromagnetic waves (Health Canada, p. 75). The main sources of environmental noise pollution are air conditioners and industrial equipment; noise from industry, construction, and demolition; noise generated by human activity such as lawn mowers or leaf blowers, loud music, barking dogs, children playing, and outdoor events such as concerts or festivals. 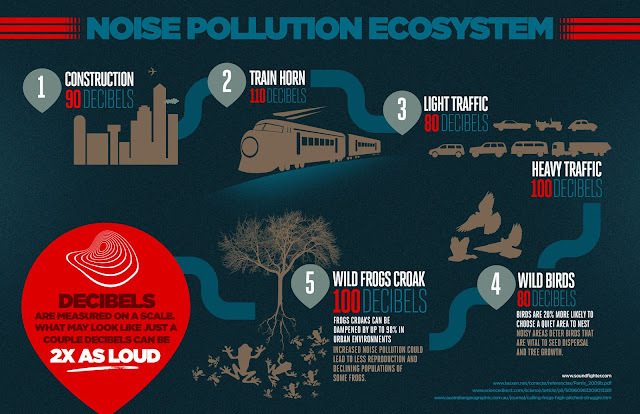 Another significant source of environmental noise pollution is transportation related: buses, trains, cars, motorcycles, trucks, and emergency vehicle sirens being the most significant cause of noise in urban areas. Airplanes, too, can affect a smaller, local community and emit significant noise on a regular basis. Most communities have federal and local regulations determining when certain noise producing activities can occur, but many noise sources are uncontrolled and unregulated and may occur at any time, day or night. The occupational hazard of noise has long been recognized by employers, and workers are now protected from the impact of noise with specialized noise reduction equipment. However, the general public remains largely unprotected and left to endure a cacophony of sounds, often for prolonged periods. One of the obvious and measurable effects of noise pollution is hearing loss. While each individual is different in their tolerance to noise, length of exposure and decibel level, temporary or permanent hearing loss can occur. However, a more difficult to measure, but increasingly significant health hazard, is the stress and agitation that may occur from exposure to loud noise. Persistent noise can increase stress levels, which in turn, can result in high blood pressure, an important health concern. Known as the "silent killer" because there are few obvious symptoms, it can result in serious health problems requiring medical assessment and intervention. Sleep disruption is another common effect of loud and/or persistent noise. Lack of sleep or a disruption of the natural sleep cycle can result in poor concentration and performance, weight changes, and a general decrease in health and overall well being. The combination of stress and lack of sleep can also lead to frustration and aggravasion. The social consequences include becoming short-tempered or potentially aggressive resulting in more accidents, poor familial and social relationships, and poor work performance. The most effective prevention against the health effects of environmental noise pollution is to reduce noise at the source. This is the responsibility of the engineers and designers of buildings. While individuals often feel they have no say over this stage of the process, they can lobby the industry or local planning departments to ensure noise reduction construction practices are in place. These may include noise reduction materials used in the actual structure and that noise reducing barriers are erected during the build to combat the impact on the receiver of the noise. Sound reducing barriers such as walls and fences may help reduce exposure to noise in urban areas. According to Health Canada's report on environmental contaminants, "for a barrier to be effective, it should be high enough to intercept the line of sight from the source to the receiver" (p. 77). While high fences do not make great neighbours, if noise pollution is affecting an individual's health, they may offer a viable solution. Devices to protect individual hearing are also available in the form of ear plugs, muffs, or head phones. Unfortunately, people who use personal listening devices, such as ipods, as a barrier to environmental noise, often place themselves at high risk for hearing loss through persistent exposure to loud music. Ultimately, it is everyone's responsibility to help reduce noise pollution by purchasing quieter household appliances, yard equipment, and vehicles; and to become aware of the affects of noise pollution on the health and well being of individuals and community members. Antidiuretic hormone (ADH), also known as vasopressin, is an endocrine hormone that helps maintain water balance in the body. Triggered by dehydration, ADH is produced by the posterior portion of the pituitary gland and stimulates the kidneys to reabsorb water from the collecting ducts. This hormone also constricts the blood vessels to prevent the blood pressure from getting too low. In some cases, an individual may have a dysfunction with ADH. This involves one of two conditions, both of which are described below. Diabetes insipidus (DI) refers to the inadequate function of ADH. This may occur due to lowered production of ADH by the pituitary gland (central DI) or lack of response to ADH by the kidneys (nephrogenic DI). A variety of pathological processes in the pituitary gland can cause central DI, most commonly tumors in the brain or pituitary gland, surgery of the brain or pituitary gland, or head trauma. In contrast, nephrogenic DI is often the result of lithium toxicity or various kidney diseases. Whatever the cause and pathophysiology may be, DI is characterized by excessive urination (polyuria), sometimes during the night (nocturia), and frequent consumption of water due to ongoing thirst (polydipsia). The diagnosis of DI involves a series of laboratory tests, mainly the osmolality of the urine and blood. Patients with DI have very dilute urine (< 200 milliosmoles per kilogram) and very concentrated blood (> 287 milliosmoles per kilogram) because water is not reabsorbed back into the blood by the kidneys. In some cases, magnetic resonance imaging (MRI) of the brain and pituitary gland can help confirm central DI. The treatment of central DI is replacement of the deficient hormone using vasopressin analogues, such as desmopressin (DDAVP). Other drugs, including but not limited to chlorpropamide and indomethacin, can be useful for nephrogenic DI. 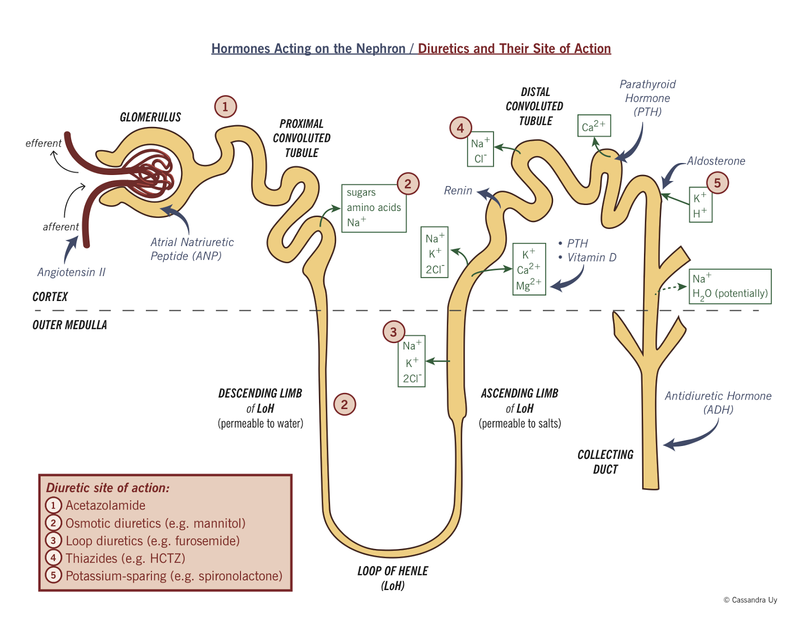 The syndrome of inappropriate secretion of antidiuretic hormone (SIADH) involves the excessive production of ADH beyond necessary physiological requirements. A number of stimuli are implicated in SIADH, such as trauma, surgery, infections, various drugs, and even tumors that constantly secrete ADH (e.g., small cell carcinoma of the lung). SIADH itself generally does not directly produce symptoms. However, patients with SIADH may experience symptoms such as lethargy, fatigue, and nausea as a result of low blood sodium (hyponatremia), a consequence of SIADH. A patient history may also suggest conditions that would lead to SIADH. To confirm the diagnosis, urine and blood tests should demonstrate low serum osmolality and high urine osmolality, provided that conditions similar to SIADH are ruled out. Besides addressing the underlying cause, if possible, the treatment of SIADH involves a combination of methods to remove excess water from the body. They include restriction of water intake, diuretics to increase urination (along with electrolytes to replete those lost through diuresis), and vasopressin antagonists such as demeclocycline. For hyponatremia, measures to raise serum sodium, such as intravenous saline, may be helpful. All of these interventions must take volume status (hypovolemia, euvolemia, or hypervolemia) into account and be done gradually to avoid complications from rapid correction.